We’ve been brewing kombucha on our kitchen counter for years, long before it was available in grocery stores. 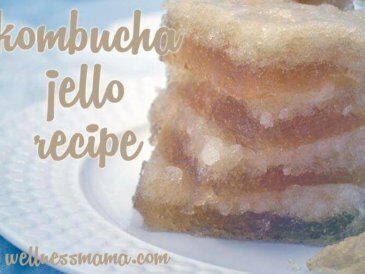 It turns out you can do more with kombucha than just drink it… you can turn it into a favorite kids’ snack that they won’t even know is good for them! 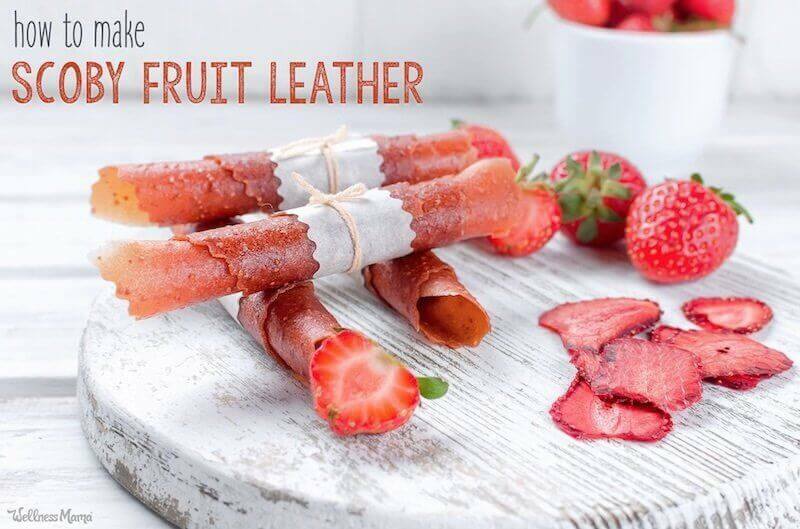 This SCOBY fruit leather recipe doesn’t require any special equipment and gets all of its yummy flavor from fresh fruit. If you’ve brewed kombucha you know that with each new batch the brewing culture, called a SCOBY (which stands for Symbiotic Colony of Bacteria and Yeast), creates a “baby” or daughter culture that can be used to brew its own batch. While this is an awesome way to continue the procreation of the kombucha species, these baby SCOBYs can add up and a new kombucha brewer may wonder what to do with them all! When I first started getting into making kombucha, I tried to pass on these baby SCOBYs to friends and family so they could brew their own kombucha as well. Truth be told, I only had a few friends who were interested in trying it, so I eventually ended up composting most of my SCOBYs because I didn’t have another use for them. Fast forward a few years and I met Hannah and Alex (who my kids call “The Kombuchas”) at a health conference. They own Kombucha Kamp and are the authors of the fantastic book The Big Book of Kombucha, which is a gorgeous and informative encyclopedia of everything about this delicious fermented drink. Hannah and Alex gave me a sample of a delicious treat that they make: fruit leather with leftover SCOBYs! I thought it was a brilliant way to use excess SCOBYs and get the benefits of the enzymes and probiotic cultures it contains. 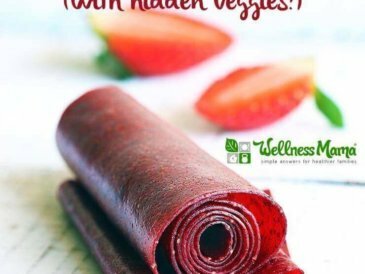 This recipe is similar to my original fruit leather recipe, but has the added benefits of the kombucha cultures. It is so simple to make and my kids love these as snacks or an after dinner treat. 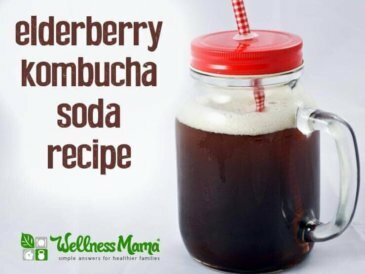 You can easily make this in a dehydrator or oven and it is the perfect way to use up extra kombucha SCOBYs. If you brew kombucha, give these a try! If you’ve never made kombucha… what are you waiting for? 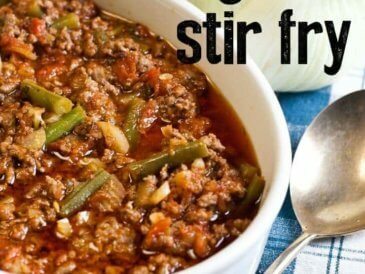 Use this simple tutorial to get started (or this one for a continuous brew) and save your extra baby cultures for this recipe. Our family loves this healthy probiotic-rich treat. When dehydrated at a low temperature, the SCOBY maintains its healthy acids and bacterial activity. Kids will never suspect this delicious snack is healthy for them! Combine the fruit and sugar in a medium saucepan. Cook over medium heat, stirring frequently, until the fruit and sugar are thoroughly broken down and combined, about 10 minutes. Add the fruit mixture and SCOBY puree to a blender, along with the spices if using, and pulse until the mixture has the texture of applesauce and all the ingredients are combined. Spread the mixture onto wax paper, parchment paper, or silicone dehydrator sheets in a layer about ¼ inch thick. Dehydrate for 12 to 36 hours. If you’re using a dehydrator, use the lowest setting (95–110°F or 35– 43°C). If you’re dehydrating in an oven, set it to its lowest temperature and prop the door open. Once the mixture is dried and no longer sticky, gently remove from the wax paper. 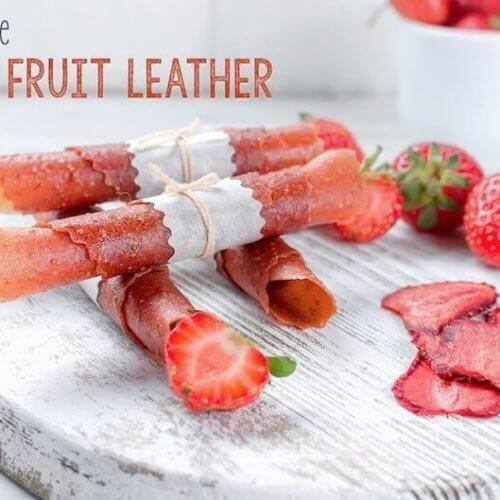 If the leather is difficult to remove from the wax paper, stick it in the freezer for 10 to 15 minutes; then peel off. Cut the leather into strips. These can be rolled up or cut into bite-size pieces. Store in an airtight container at room temperature; they will keep indefinitely but might dry out over time. Play with the spices and fruits to come up with your favorite kind -- the combinations are endless! 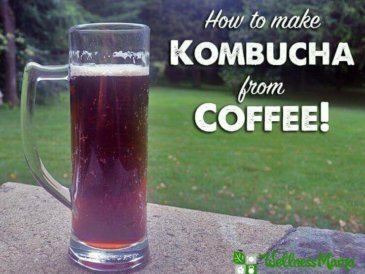 Do you brew kombucha? Will you start? Recipe excerpted from The Big Book of Kombucha © Hannah Crum © Alex LaGory. Photographs by © Matt Armendariz. Used with permission of Storey Publishing.